View the full 2017 Tulsa Shootout results sheet below. The results are from the Tulsa Expo Raceway dirt race on December 31st, 2016. Day four of the short track racing event. TULSA, Okla. (December 31, 2016) For the 32nd year, the Speedway Motors Tulsa Shootout is set for a final run towards the coveted Golden Driller as the B-Mains have begun with drivers making their final bid into the A-Features on Sunday, January 1, 2017. 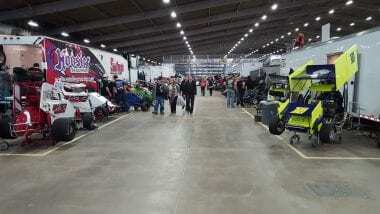 Getting underway at 10:00 A.M. (CT), with the remainder of B-Feature and Last Chance Qualifiers, the finale of the Speedway Motors Tulsa Shootout will begin with opening ceremonies at 3:00 P.M. on Sunday, January 1. Nine A-Features will decide who walks away with a Golden Driller. Going into Sunday’s showdown 103 drivers have already locked into one of the nine A-Features with 33 making their way into at least two. Only six drivers so far have three chances to win and of those, Oklahoma’s Frank Flud and Pennsylvania’s Tyler Walton have locked into four A-Feature events. For Flud, who has earned three Tulsa Shootout Golden Drillers, the Pryor native will see his chances at adding to his collection in both divisions of A-Class and Outlaw Micros. Flud’s most recent win came in 2015 in the 1,200cc Non-Wing Mini Sprints. Prior to that, Frank doubled up in 2014 with Outlaw Winged and A-Class Non-Wing triumphs. Walton, who has yet to top the Shootout, will see action in both divisions of A-Class as well both styles of 1,200cc Mini Sprint. In Micro/Mini Sprint competition, eight Tulsa Shootout wins have gone to the state of Pennsylvania. Most recently was Michael Dicely, as the Harrisburg native topped the Non-Wing Mini Sprints in 2013. Drivers locked into a trio of A-Mains include Chance Crum, Cory Eliason, Jake Hagopian, and Ty Hulsey. None have made it to Victory Lane in the Speedway Motors Tulsa Shootout but have positioned themselves nicely to do so. General Admission for Sunday is $20. Kids 10 and under get in free with an adult. For those unable to attend, the full event can be purchased online via Racinboys.com, who is the official online PPV provider. For continued updates on the 32nd Speedway Motors Tulsa Shootout, log onto http://www.tulsashootout.com. No. 9m of Chance Morton, DQ’d for an illegal RR Tire. No. 222 of Taylor Reimer, DQ’d for illegal Top Wing. No. 27d, Jared Dunkin, DQ’d for illegal Right Rear Tire. No. 222 team DQ’d for attempting to change drivers after the draw. No. 17q, Quinn Jones, DQ’d for entering the track after told not to by officials. No. 211 of Steven Parker DQ for illegal RR Tire. Heat 7 (8 Laps): 1. 3L-Jimmy Leal; 2. 8J-Josh Marcham; 3. 49-Joel Smith; 4. 02-Cody Freeman; 5. 00-Tony Sinquefield; 6. 24T-Eddie Martin; 7. 51J-Joshua Huish; 8. (DNF) 66-Wayne Feagle, Jr.
No. 13 DQ for illegal RR Tire. No. 88A of Joshua Ames, DQ for illegal Cockpit Adjustments. No. 17, Conner Lee, DQ’d for being light at the scales. No. 41, Colton Hardy, DQ’d for the crew working on the car on the track. No. 13, John Kahl, DQ’d for being light at the scales. No. D6, Dakota Gains, DQ’d for failing to go to the scales. Heat 12 (8 Laps): 1. 29L-Nate Lauderbaugh; 2. 16-Randy Sims; 3. 3L-Jimmy Leal; 4. 172-Greg Reynolds; 5. 15X-Kyle Jones; 6. 67T-David Hall; 7. (DNF) 23P-Trevor Peden; 8. (DNF) 66-Wayne Feagle, Jr.
Heat 19 (8 Laps): 1. 21T-Ty Hulsey; 2. 78S-Daniel Shaffer; 3. 10X-Bryan Debrick; 4. 36A-Blake Edwards; 5. 48K-Joe Klonoski; 6. 7-Wyatt Rector; 7. 2S-Robbie Smith; 8. 45-Jax Addams, Jr.